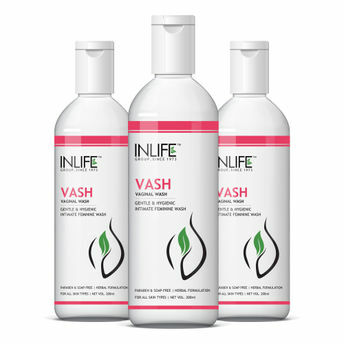 INLIFE Vash (Vaginal Wash) is exclusively formulated to take care of the hygiene of your private part. Being formulated with Sea Buckthorn, Neem, and Aloe Vera, it keeps the area free from bacteria and bad odor. The INLIFE Vash cleans the intimate area without causing any harm or reaction and is suitable for any skin type. It maintains the pH balance in the area and makes you feel confident about yourself. Use the vaginal wash, whenever required because it does not harm the body in any way.